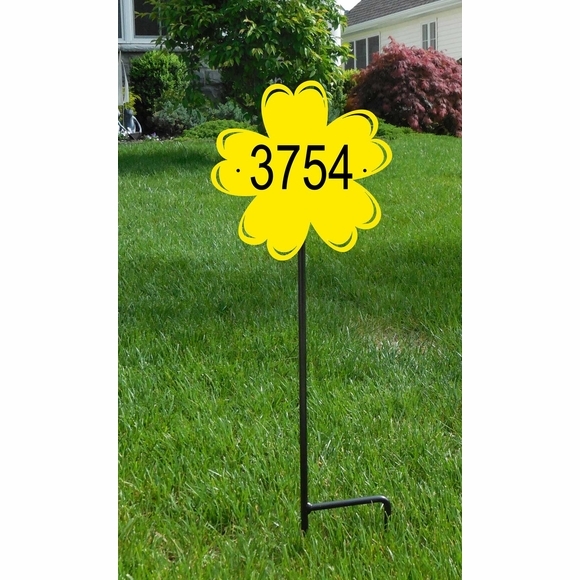 Lawn Mount Flower Shape Address Sign - - personalized house number sign has five-star curb appeal. Large silhouette flower shape address plaque is approximately 10"W x 10"H. Includes lawn stake. Made in the USA. This address sign will hold up to three (3) 3" characters or up to four (4) 2.5" characters. Made from sturdy and UV-stabilized non-rusting laminated acrylic plastic with engraved personalization. Characters are permanently engraved into the silhouette during the production process not painted or printed on the surface. Cutout crescents near the tip of each petal allow the background color to show through. The result is a one-of-a-kind, two-tone color combination. Withstands temperatures to 175 degrees F without deflection. Eight vivid color combinations: sky blue with white characters; black with white characters; white with black characters; brushed gold with black characters; brushed stainless with black characters; kelley green with white characters; red with white characters; and yellow with black characters. Dimensions: 10"W x 10"H x 1/8". Ships with one American-made 24" black solid steel lawn stake. Stake includes a slotted mounting plate and two stainless steel bolts with lock nuts. Normal ground insertion leaves a visible stake height of 18". The double "h" leg at the bottom keeps the stake from rotating and provides stability that cannot be achieved with a single post. Flower silhouette can be made smaller or larger up to 23.5" wide. Please contact us for pricing on the sign size you need. Click top link in Related Products to purchase a wall mount Flower Shape Address Plaque.